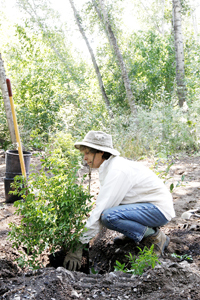 Pamela Tucker, a volunteer with the Hailey-based Wood River Land Trust, plants a shrub in a restored area in Lion’s Park west of Hailey. Excavators recently removed 1,200 tons of accumulated trash in preparation for the restoration project, which seeks to create a larger, more naturally functioning wetland and riparian area. This is an election, about character, experience, judgment and will.